2010 RAMROD souvenir jersey. 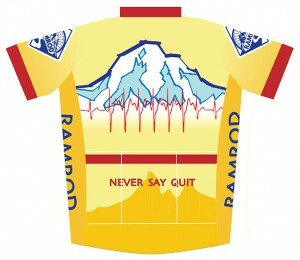 I reprised the heartbeat theme from the popular jersey of 1997 at the request of Redmond Cycling Club and the RAMROD committee. Some of you might even remember the old one. By the way, the darker gold curve at the bottom is the ride’s elevation profile. 1997 happens to be the first year I ever rode the Ride Around Mt. Rainier in One Day myself. I still have that year’s jersey, which featured a day-glo yellow box on a blue ground. The yellow is still day-glo on the front, but has faded to a soft whitish lemon on the back, which bore the brunt of the sun on many rides. 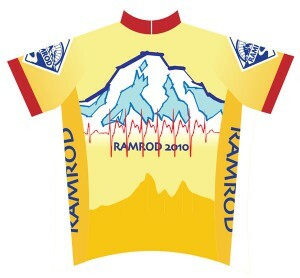 If you were fortunate enough to get entry into this year’s RAMROD, I hope you also get the jersey to remember it by. May your jersey fade to tatters long before your memories of the ride, and may you wear it in good health. Rubber side down. Three of my small oil studies will be in the show “Art in Agriculture,” at the Columbia Center for the Arts in Hood River Oregon, May 7-30. 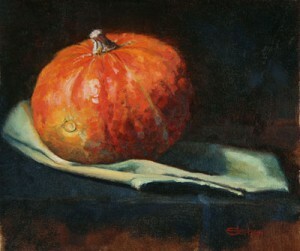 The amazing variety and color in the farmers’ markets last fall inspired a variety of quick studies of fruit. I tried to finish each painting in one or two sittings, so the models were still fresh enough to eat afterward.